Midas Investments: Vard Holdings - Hype And More Hype? Vard Holdings - Hype And More Hype? Vard Holdings is a major global shipbuilder, constructing offshore and specialized vessels used in the offshore oil and gas exploration and production and oil services industries (http://www.vard.com/about/Pages/default.aspx). After conducting my due diligence on this company, I have determined this company to be overvalued at its current price, but is surprised by the amount of positive sentiments despite its increasingly bad operating performance on forums. Before I go into why the company is not attractive and would not be of value to an intelligent investor, I would like to show the readers the 3 statements of the company. All the statements are compiled from the annual reports provided by the company at its official site (http://www.vard.com/Pages/default.aspx). From its income statement, you can see that EPS has been falling. Not only that, revenue has been relatively stagnant and shows a decreasing trend despite the increase in operating costs and cost of goods sold. Another thing that bothers me about this company is the increase in salaries and related costs despite the company's sluggish performance. One might remember that when I invest in companies, I want a solid and credible management team. However, this company just cannot reassure me when looking through their statements. I invest for the long term and I do not feel safe parking my money at this company and the fact that its key operations are done in Norwegian Krone presents even more risk to me. I would also like to mention the fact that number of shares increased to 1,180 million from 1,025 million from 2010. I hate share dilution that does not add value to the shareholders, and a search on SGX was not able to bring up the relevant announcement, giving me more doubts about this company as I do not know for what and why there was an increase in number of shares. 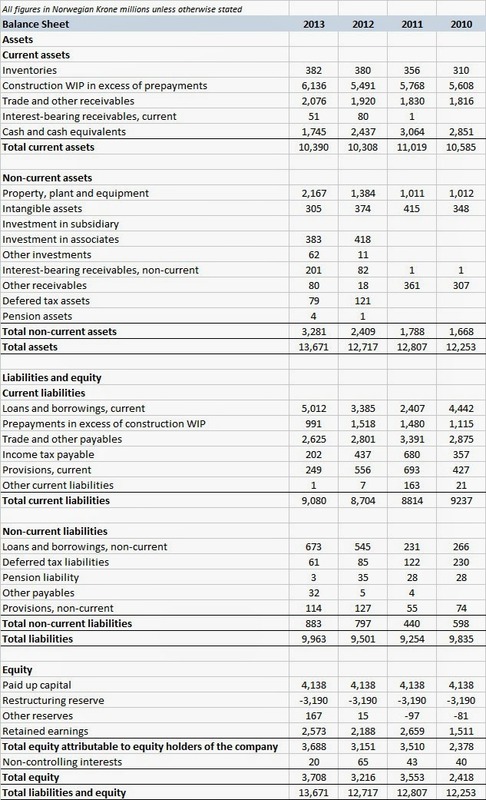 Next, we will move on to the balance sheet. Although the company is relatively strong in terms of its balance sheet. I am just not comfortable with the increasing loans and borrowings. I just do not feel good about this company as I feel that the increase in debt has not generated additional returns for their shareholders. EPS remain low and has fallen by quite a huge margin for the last 2 years. According to Graham, net working capital (CA - Total Liabilities) can be an indicator of a bargain issue but the company's net working capital has fallen from 750 million NOK in 2010 to 427 million NOK in 2013. This doubly reinforces my thoughts that the company is overvalued. Next, let us move to the cash flow statement. 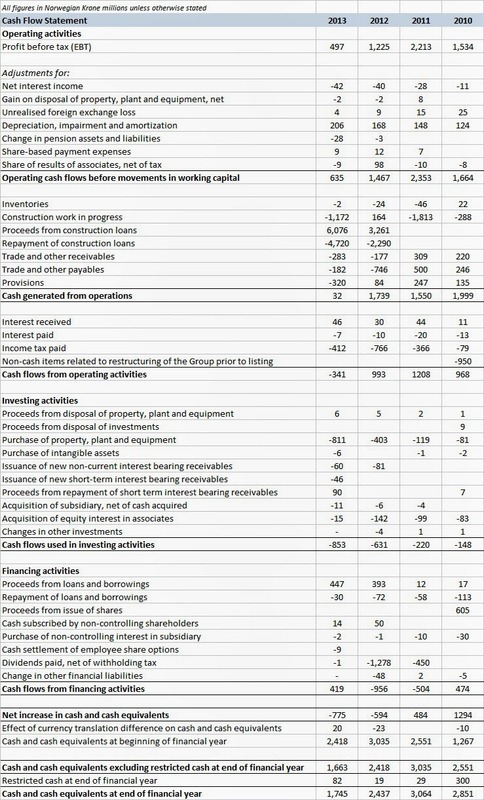 The key takeaway I get from browsing through the cash flow statement is that the company is burning cash. 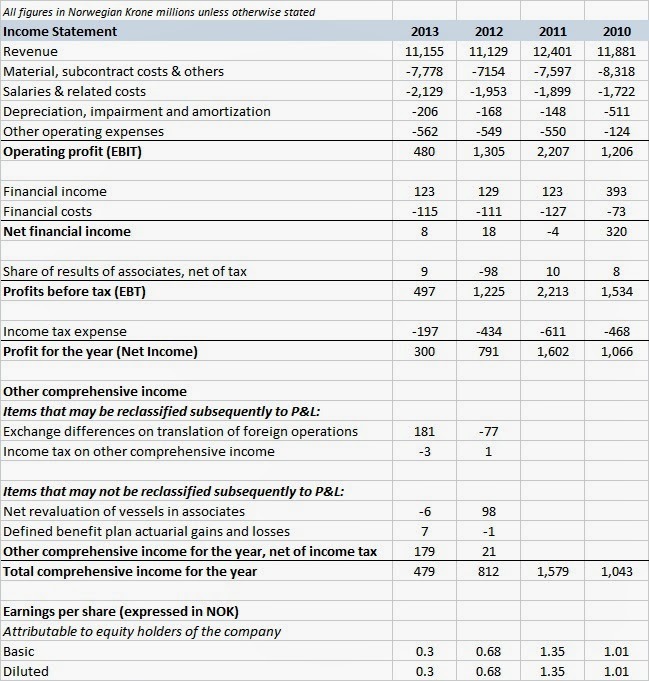 The company actually have a deficit in cash for the past 2 years but was able to still have a positive cash flow at the end of the financial year from past cash reserves. I do not like a company that is burning so much cash, especially when they have a poor dividend policy (no dividends in 2013 despite a profitable year). One thing significant in FY2013 though is the increase in investments which might lead to higher prospects for the company. However, spendings on investments in FY2012 was also substantial but the company still experienced a lacklustre year in 2013. By the end of the first statement, I was actually no longer interested in the company but to ensure that there is depth and breadth in my analysis, I will go on to the last excel sheet, which is the ratio analysis. I would just like to highlight several quick ratios in the sheet above. 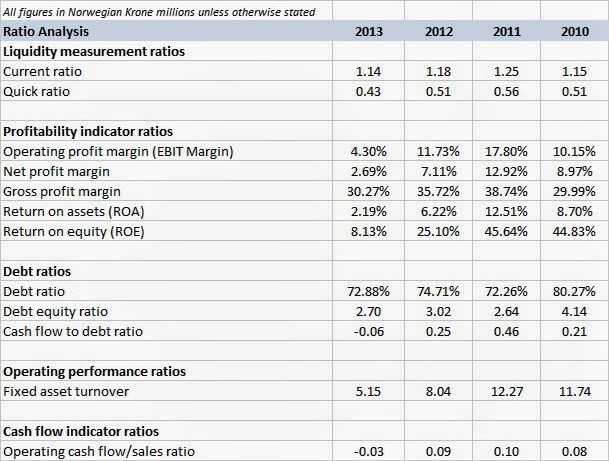 If we take a look at the profitability indicator ratios and the operating performance ratios, we will notice that the company's operational performance is really declining at a fast rate. The company's operational performance is seriously disappointing at its current high valuation. To summarize, this company is disappointing but various research reports actually suggest a buy on this company with various forums commenting on the growth prospects of this stock. What is my take on this? I feel that this company does not deserve its current high share price. Moreover, its dividend poor policy makes it doubly unattractive. Be careful before putting money into this stock, the hype on this stock is incredibly strong, with various sell side analysts pitching a buy. At the end of the day, do I think the stock will go up? I think the stock will go up if the market expects it to go up, but over the long run, we will see the stock reaching its true value and personally, I do not think it will be up. What is my target price on this? I did not bother to do a valuation on this stock as I think it will be a waste of time but readers who want to carry out valuation can request the excel sheets from me. For readers who are holding on to this stock, I would suggest you to offload. However, if you believe in the hype, you can continue holding. After all, speculation drives prices in the short run. As a value investor, this is definitely one stock I would abstain from. For readers who are interested in similar stocks, you can take a look at ASL Marine Holdings. I do not hold any stocks in ASL Marine Holdings as of this moment, but after taking a look at it while pondering whether I should do a full fledged competitor analysis, I find possible potential for this stock, in terms of its P/E and P/B ratio, as well as more stable revenue growth and profit margins. Please do your own research before deciding on whether to buy this stock. With that said, feel free to let me know of how you feel about this stock. Thank you very much.